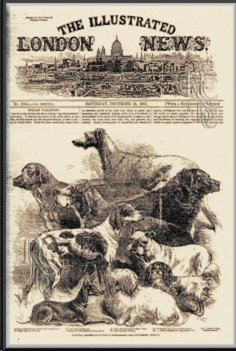 It is more than 150 years since Messrs Shorthose & Pape sponsored their exhibition of Pointers and Setters on the 28th and 29th of June 1859, which is now recognised as the first ever dog show. In November of the same year Birmingham staged its first ‘Exhibition of Sporting Dogs’ with around 80 dogs entered in its 14 classes. Above: Harrison Weir’s illustration of exhibits at the Birmingham Dog Show Society’s ‘National Exhibition of Sporting and Other Dogs’ — December 3rd & 4th 1860, which appeared on the front cover of The Illustrated London News 15th December 1860. Opportunities to exhibit Sheepdogs were not numerous in the early days, making advancement initially slow, however The Kennel Club’s show in January 1887 mustered an entry of 132 Sheepdogs, which was the highest entry for any breed or breed type, and Rough Collie entry levels have remained high ever since. Much has changed in the almost 150 years since Collies were first shown. No longer do show organisers favour the cattle markets, drill or village halls, with there cramped conditions, poor lighting and frankly almost unsanitary facilities, so popular until as late as the 1950s and early 60s. Nor are the dogs expected to spend the entire show, which could last several days, confined to their bench with the twin exceptions of brief periods for exercise or whilst actually in the ring being judged. Below — One of the earliest all tented outdoor shows in the United Kingdom was Blackpool, & District Canine Society’s first post-war Show held at the Oval, Stanley Park over three days in June 1948. 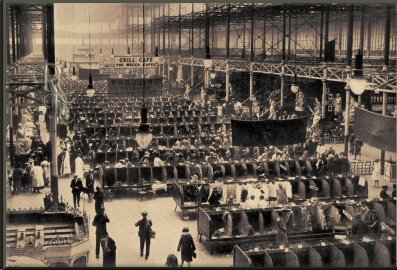 Blackpool, always an innovative show society, had been the first to schedule breeds on different days thereby removing the need for all exhibits to remain throughout the period of the show. 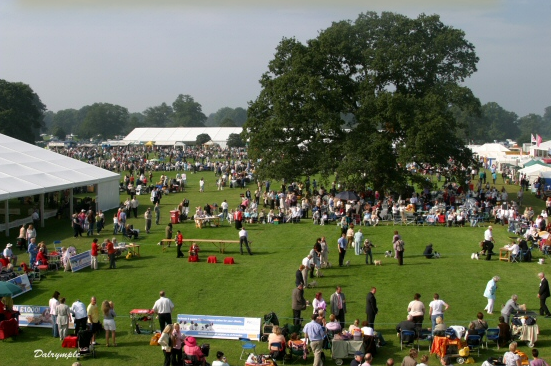 The above image of Darlington Dog Show at Newby Hall, Near Ripon illustrates the more relaxed atmosphere and spacious surrounding of a modern Championship Show. Modern indoor shows are much more likely to be staged in spacious indoor equestrian arenas, sports or exhibition centres, while the larger outdoor shows resemble tented villages with their lavishly decorated undercover main ring complete with tiered seating for important guests, extensive outdoor rings for breed judging, tented benching areas and rings suitable for wet weather judging, plus shopping malls where the dog owner can satisfy every conceivable canine need. The atmosphere further improved by the freedom exhibitors enjoy to come and go as they please now that the enforced removal embargo has been removed at all but a few of today’s shows. All of which allows exhibitors and spectators of all ages to enjoy the company of their dogs in a relaxed and friendly atmosphere amongst like minded associates.